Are High Security Checks Worth It? Why Pay The Extra Cost. Designing Business Cards, Postcards & Flyers Online: Is It Worth The Time And Effort? Have you ever thought about how certain colors make you feel? How about, if you wear a certain color others may perceive you in a certain way? Or if you go to a website and depending on their color scheme you either connect with the brand or not? The psychology of color, especially when talking about persuading someone is one of the most popular subjects, as well as most controversial, especially in the aspects of marketing. As humans, we are very visual. Our brain processes images 60,000 times faster than it processes text. In the “Impact of color on marketing” study, researchers found that up to 90% of immediate impressions about products and brands can be made based on color alone. This means that our own understanding of colors allows us to make decisions on a daily basis on a subconscious basis. Because of this, we need to understand how colors within images affect us. When it comes to color psychology, one of the most important things to keep in mind is that people respond differently to colors based on their gender, age, and cultural background. When it comes to gender, research has proved that blue is the most popular color for both men and women. However, not only gender but the age of the person is also known to influence color preferences. The younger the audience the more they are drawn to bright, youthful colors, while older audiences prefer cooler shades such as green, blue and violet. It is also important to keep in mind the location and culture of the individuals within your target market, especially if you are expanding into new markets internationally. Because of this, do some research since a color considered to be acceptable in one culture may be offensive or seen in a negative light in another, depending on the context of the image. By choosing colors that the audience is open to seeing and responsive to, brands can have an advantage over their competitors. “Color sets the mood of brand expression and, more important, it creates mental associations to the meaning of your brand within the context of the world it lives in,” says Brand Strategist Thomson Dawson explains. Research has shown that the color red causes people to react with greater speed and force, which could be useful when talking about sports or other physical activities. In the meantime, you also have automotive companies such as Ferrari and Lamborghini who combine red and black to create a balance between the powerful and the luxurious. It is important that a brands color scheme matches the personality of the brand along with their culture. According to an article in Adweek, colors can be a staple of a brand and people will identify certain feelings and images directly with the brand when they see their colors. You can see this with Coca-Cola’s characteristic red, or the yellow golden arches of McDonald’s, these are brand staples that you wouldn’t be able to change. Once you understand the type of people you want to attract with your brand, your personas, you will start to understand your brand personality. This will allow you to create what your visual identity will look like. Content marketing expert Neil Patel suggests using color psychology in order to be able to make a good impression to the people that are coming in contact with your brand. This can be through an advertising they see, a brochure, or even your website. 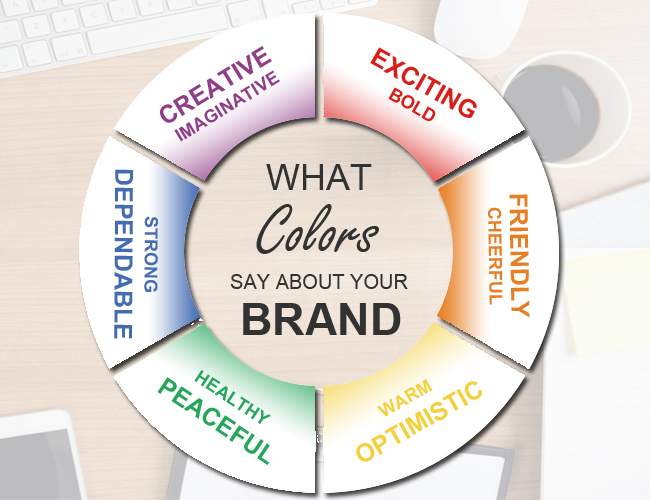 He says that your colors should immediately communicate what your brand represents, leaving a positive impression on your potential customer. Psychologist and Stanford professor Jennifer Aaker wrote a paper titled “Dimensions of Brand Personality” and she points out five core dimensions that play a role in a brand’s personality. While certain colors align with specific traits, for example, blue with being down to earth and sincere, red with excitement, and green with competence and being successful, nearly every academic study on colors and branding will tell you that it’s more important for colors to support the personality you want to portray instead of trying to align with stereotypical color associations. It is also important to note that brands can sometimes cross between two traits thus having 2 various colors they want to focus on, but they should be dominated mainly by one and have that be the focus. The study Exciting Red and Competent Blue confirms that colors affect the purchasing intent because of the impact they have on how a brand is perceived. Colors influence how consumers view the "personality" of the brand they are looking to buy from. You probably wouldn’t think to buy a Harley Davidson motorcycle is you didn’t get the feeling that Harleys were tough and cool, right? However, as we said, it is more important for colors to support brand personality over the stereotypical color associations. Think about how making broad statements such as "green means calm” is actually false, because the context is missing. Green can be used when talking about healthy foods/drinks such as Tropicana or Whole Foods, but other times it's meant to brand financial spaces such as Mint.com or Huntington. And while brown may be useful for a manly or tough appeal such as Harley Davidson or the Home Depot, when positioned in another context brown can be used to create a warm, inviting feeling think Thanksgiving, or it can be used in delicious food context as well, think of M&M’s or Dreyer’s Ice Cream. When it comes to shades, tints and hues women tend to prefer softer colors, while men gravitate towards bolder, darker colors. Men are also more likely to select shades of colors as their favorites (colors with black added), while women prefer tints of colors (colors with white added). You can see that when choosing colors for your brand is all about the context and how you want your brand to be perceived and who you are actually trying to target. Color is a very powerful visual component for your brand. Colors need to be used to appeal to specific audiences and aim to create specific responses from their current and potential clients. However, testing is also key, the right combination of colors will only become predominant through A/B testing and gauging the reactions from your prospects. It is important to keep all of this information in mind when choosing your brand's primary color palette. Whether you go with having your color palette be red and intense, yellow and joyful or black and mysterious, its colors are announcing something to the customer. As you create the perfect logo, be sure to pay attention to the color messages you're sending. DesignsnPrint can help bring your brand to life through custom printed solutions for your business. We offer a wide range of products personalized with your company information. Feel free to contact us at 678-528-3233.